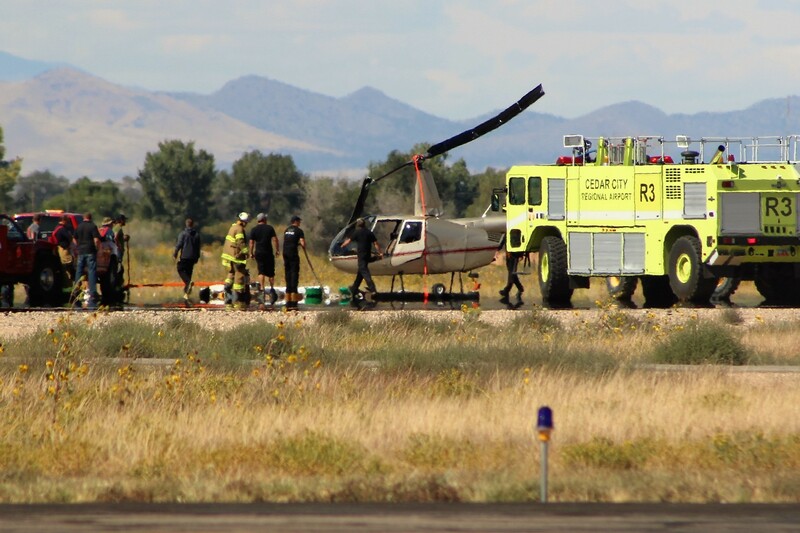 CEDAR CITY — Emergency crews responded to a minor helicopter crash at the Cedar City Airport Wednesday. At approximately 1:30 p.m., a R44 helicopter involved in a routine training maneuver tipped over on its right side above the helipad. The helicopter was piloted by Colin Smith, a flight instructor for Southern Utah University’s Aviation program was working with a student, Tray Wegenhoft, when the incident happened. Smith had a minor scrape as a result and Wegenhoft was uninjured. Cedar City Police and Fire Departments both responded to the scene, as did SUU Campus Police, to assess security issues and if there was any hazardous material in the area. Fire crews cleaned up several gallons of gasoline that had spilled from the aircraft landing on its side, said Cedar City Police Lt. Jimmy Roden. Investigators did not immediately know what caused the helicopter to tip over, authorities said. The incident is under investigation by the National Safety Transportation Board. “Training in all conditions leads to the safest pilots. We will continue to work with authorities to ascertain the cause of the incident,” said Mike Mower, executive director of the Aviation Program . The NTSB cleared the R44 at around 3 p.m. and returned it to the hangar, said Ellen Treanor, executive director of Brand Strategy at SUU. Apparently the crash didn’t involve a sister elder or senior member of the LDS church or it would have been mentioned incessantly throughout the article. They would have been flying to Mesquite to open a missionary apartment and got blown over by a unsafe wind gust. Was there a book of mormon on board? Did any of the pilots have mormon relatives? Is there any chance they knew a missionary? THESE are the real facts that readers need to know!